There is nothing more impressive to guests, or your stomach, than a perfectly roasted chicken. What seems like a complicated feat is actually one of the easiest and best recipes to have in your repertoire. This particular recipe is great to serve to your special guy (can you say new *engagement chicken!?) because it is wrapped in BACON! Who doesn’t love bacon? Ok, my roommate doesn’t like bacon, but I don’t need to make this for her. But any single, hungry guys out there are welcome to come over for dinner! First, preheat the oven to 425 degrees F. Remove chicken giblets (anything inside of the chicken) and rinse the entire chicken both inside and out. Pat the outside dry and place the chicken in a large roasting pan. Liberally salt and pepper the inside of the chicken and stuff the cavity with the thyme (saving enough to garnish the dish later), 1 halved lemon, and 2 halves of garlic. Brush the outside of the chicken with butter and sprinkle with salt and pepper. Tie the legs together with kitchen string (or, if you are like me and forget to buy kitchen string every time you go to the store, don’t tie them) and tuck the wing tips under the body of the chicken. Quarter 2 of the remaining lemons and place around the chicken with the rest of the garlic. 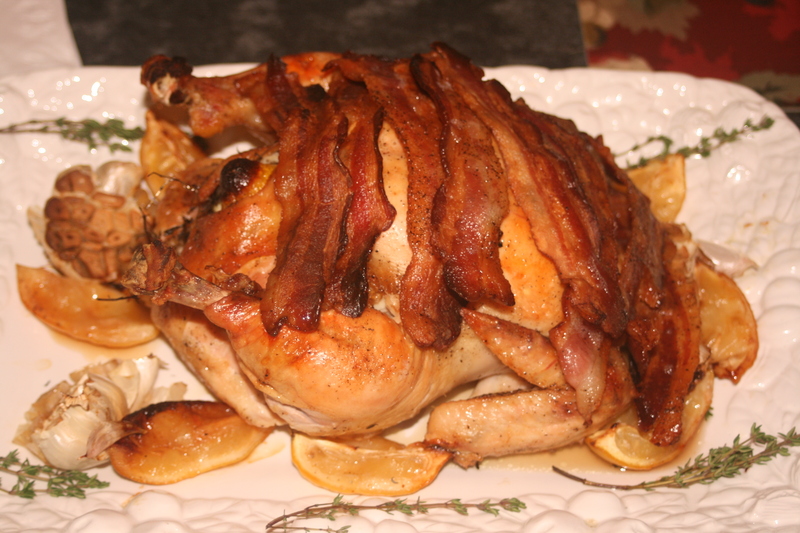 Lastly, lay slices of bacon over chicken until it is covered (this is obviously the best part!). Put chicken in the oven and roast for 1 hour. After this time, remove the bacon from the chicken and set aside. Finishing roasting the chicken for another 1/2 hour, or until the juices run clear when you cut between the leg and thigh. When the chicken is done, set aside and cover to keep warm so you can make the gravy. Using the fat drippings at the bottom of the roasting pan, add the wine and chicken stock and bring to a boil. Once boiling, reduce the heat and simmer for about 5 minutes or until reduced by half. Everything is now ready to come together! 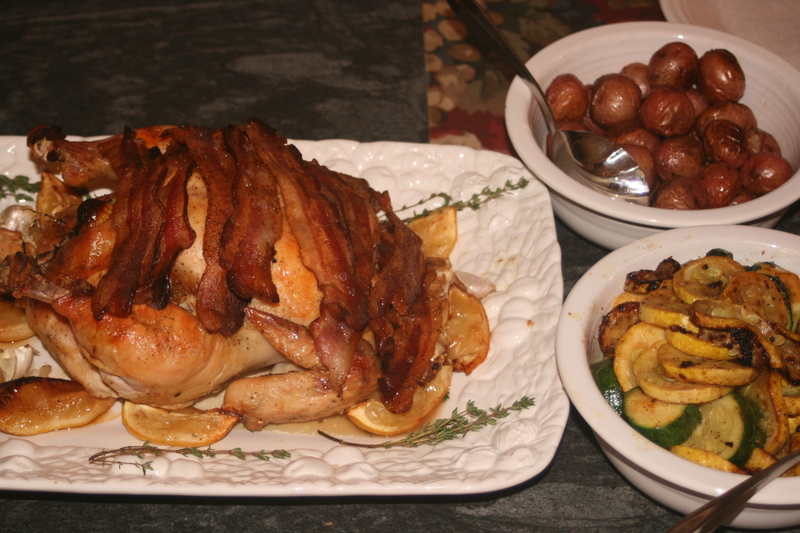 Place the chicken on a nice serving dish and garnish with the bacon, roasted garlic, reserved fresh thyme, and the remaining lemon sliced. Serve the gravy on the side and enjoy! 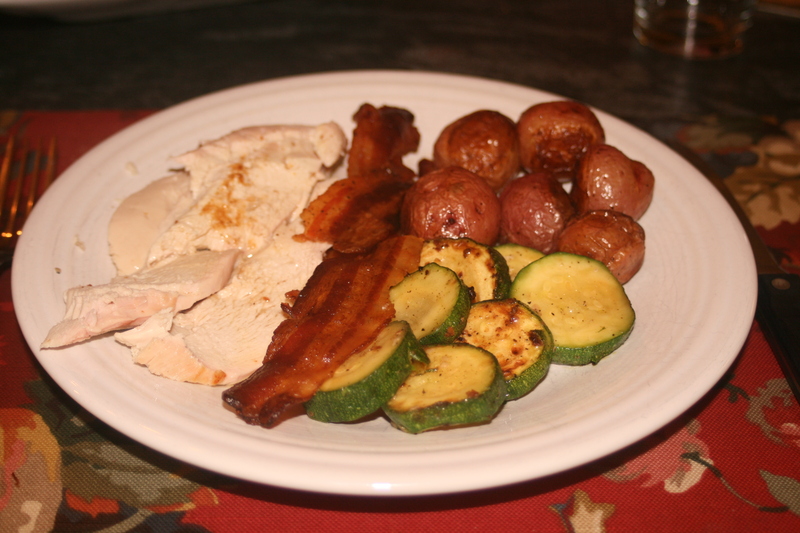 As you can see above, I served the chicken with sides of sautéed zucchini and small roasted potatoes. The zucchini is one of my go-to vegetable sides that is easy to make and very delicious. The cute little potatoes are also great with the chicken because not only are the tasty (and of course every good chicken meal needs a potato side) but they are fun to eat because they are so small! When making small potatoes like this, the key is to buy them all in similar size so they cook evenly. Slice up the chicken, load up the plates, and enjoy! I lucked out and the chicken breasts were perfectly juicy and moist. Ladle some gravy on your plate for a little extra flavor (I found it to be dominantly wine flavored, which I enjoyed). This simple but delicious meal will wow guests and provide ample leftovers for you to enjoy later! Enjoy your Show-Stopper Roast Chicken! *For those of you who don’t know what engagement chicken is, it basically is a simple but amazing recipe for roast chicken. The story goes that a girl who makes this roast chicken for her significant other will soon after be proposed to because it is just that good. Hence, engagement chicken! Yummy! looks so good! And I LOVE bacon with everything! Great pics of all the dishes you made. Everything looks really delish!